We take a look at some companies that are developing novel solutions to overcome the limitation posed by conventional hearing loss solutions. Hearing impairment is a chronic disability that affects people of all age groups. Worldwide over 360 million people are affected by this condition making it the second most prevalent health issue. According to the data made available by National Institute on Deafness and Other Communication Disorders (NIDCD), an estimated 2 to 3 out of every 1000 children in the U.S are born with detectable hearing loss in one or both ears and over 15% of American adults (37.5 million) aged 18 and over report some trouble hearing. The Hearing health foundation statistics place this number at over 50 million Americans. This condition can lead to social isolation, lower quality of life, and higher rates of dementia and depression. Hearing loss can occur due to age related degeneration, genetic factors, trauma, chemotherapy induced, ototoxic medications and viral or bacterial infections. The incidences of hearing loss are likely to rise further owing to increased exposure to hazardous noise levels and a growing geriatric population. Lifetime healthcare costs of untreated profound hearing loss are estimated to cost more than $1 million per person in the U.S alone. A report by Zion Market Research projects a CAGR of 5.45% for the Global Hearing Aid market and estimates that it will be worth over USD 9.17 billion by 2024. A staggering 28.8 million U.S. adults could benefit from using hearing aids, according to data available at NIDCD. As of December 2012, roughly 58,000 devices have been implanted in adults and 38,000 in children in the U.S. However, hearing aids pose many challenges and offer ineffective relief. New research focused on Gene therapy is offering hope to patients suffering from this disability; we take a look at some companies that are developing novel solutions to overcome the limitation posed by conventional hearing loss solutions. The company’s lead product candidates for treatment of acute inner ear (sensorineural) hearing loss (ASNHL) is AM-111 (SONSUVI), which has a D-JNKI-1, an inhibitor of the JNK stress kinase attached to an intracellular transporter. It comes in a biodegradable and biocompatible gel formulation that can be administered through a single dose intratympanic injection and overcomes the “Draining off” limitation offered by conventional therapeutics. 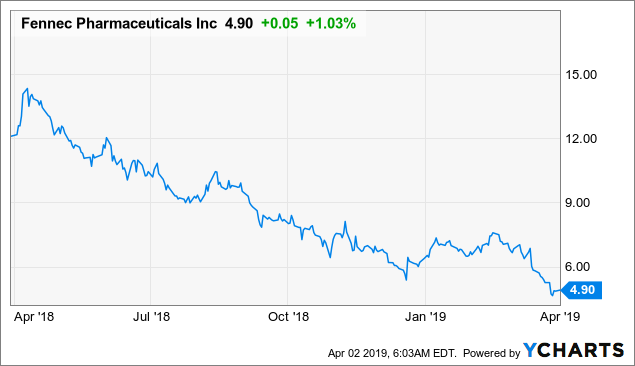 It has received an Orphan Drug Designation and a Fast Track Designation from the FDA and the EMA and is currently undergoing phase III clinical trials. In addition, the company is also developing Keyzilen for the treatment of acute inner ear tinnitus caused by traumatic cochlear injury or otitis media (middle ear infection). The product contains Esketamine hydrochloride, N-Methyl-D-Aspartate (NMDA) receptor antagonist and is currently in Phase III clinical trials. Its pipeline also consists of AM-125 for the treatment of Vertigo and AM-201for antipsychotic –related weight gain and somnolence, these have completed Phase I trials and will move into Proof of concept studies in 2019. The company has entered into research collaboration and licensing agreement with Inserm for Keyzilen, while it also has a similar partnership in place for Sonsuvi with Xigen. It has tied-up with King’s college London for discovery of small molecules for the treatment of tinnitus. As per its Q4, 2018 financial results, the company had cash and cash equivalents of CHF 5.4 million as on December 31, 2018. The company manufactures OTIPRIO, a ciprofloxacin otic suspension 6% that acts as a fluoroquinolone antibacterial for treatment of bilateral otitis media and acute otitis externa with effusion for pediatric patients over 6 months of age, undergoing tympanostomy tube placement. It is the first-in-class single dose ciprofloxacin otic suspension that encompasses the company’s proprietary thermo sensitive liquid-to-gel technology that changes from liquid to gel once inside the middle ear. It has an extensive product line targeted at OTIC disorders including Otitis Media, Acute Otitis Externa, Ménière’s disease, Tinnitus, CIHL and sensorineural hearing loss. Its patented Otonomy technology offers the ease of single administration, minimal peripheral exposure and overcomes patient compliance issues. It is developing three programs that target different pathologies, first of which is Synopathy repair in case of speech-in-noise hearing loss (OTO-413), which is a sustained-exposure formulation of brain-derived neurotrophic factor (BDNF) that helps in neuron growth and synase repair. 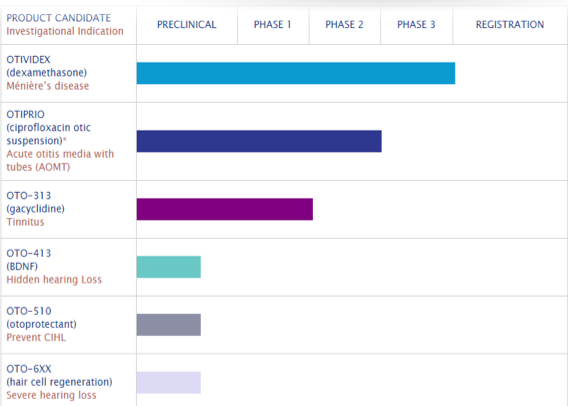 It is expected to start undergoing Phase I/II clinical trials in Q3, 2018. The second candidate is an otoprotectant that can prevent cisplatin-induced hearing loss (CIHL) caused due to ototoxicity by exposure to platinum-based chemotherapeutic agents and aminoglycosides. The third candidate is OTO-6XX that aims to regenerate hair cells and treat hearing loss. In addition, the company’s pipeline consists of OTIDIVEX (dexamethasone) for the treatment of Ménière’s disease, OTO-313 (gacyclidine) for the treatment of Tinnitus, OTO-413 (BDNF) for hidden hearing loss. OTO-510 (otoprotectant) for prevention of CIHL and OTO-6XX for severe hearing loss. The company has entered into a co-promotion agreement with Mission Pharmacal Company for promoting OTIPRIO (ciprofloxacin otic suspension) for acute otitis externa (AOE) in the U.S, in consideration of an annual co-promotion fee and reimbursement of a part of product support expenses, and retain a share of gross profits from the sale of OTIPRIO to Mission’s accounts. 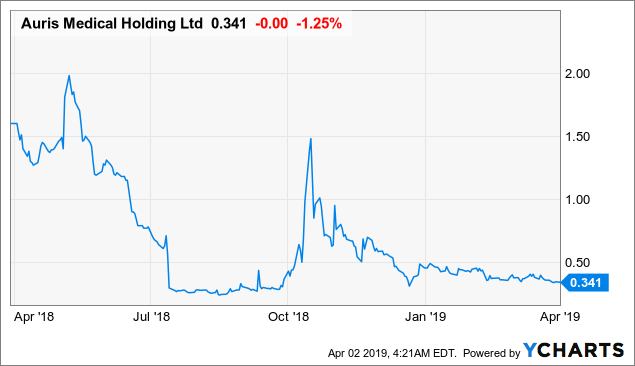 It completed a $15 million term loan financing with Oxford Finance LLC for a 24-month interest-only repayment period with no financial covenants or warrants associated with the loan. 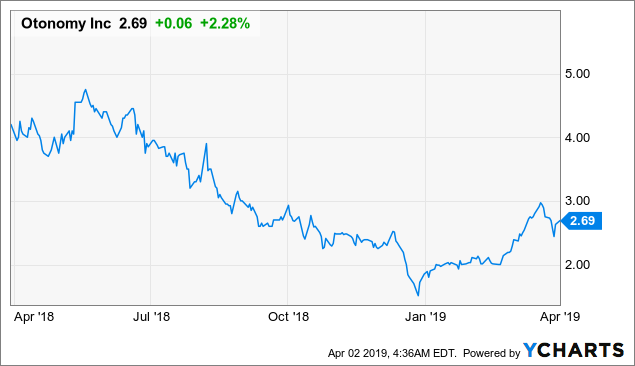 This helped the company close its year-end with cash, cash equivalents, and short-term investments of $97.3 million as of December 31, 2018, compared to $120.0 million as of December 31, 2017. 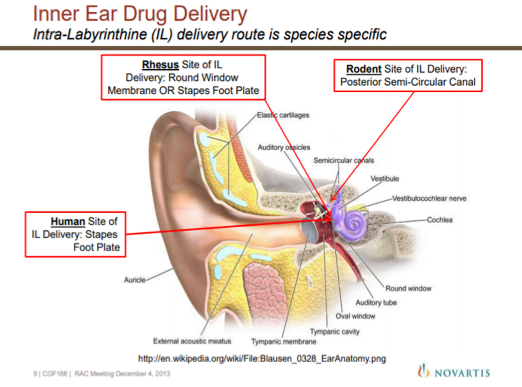 Decibel is a pioneer in the development of translational therapeutics for inner ear disorders. The company is creating cutting-edge hearing loss solutions by combining the knowledge of genetics, genomics, and inner ear biology with bioinformatics and microsurgery. 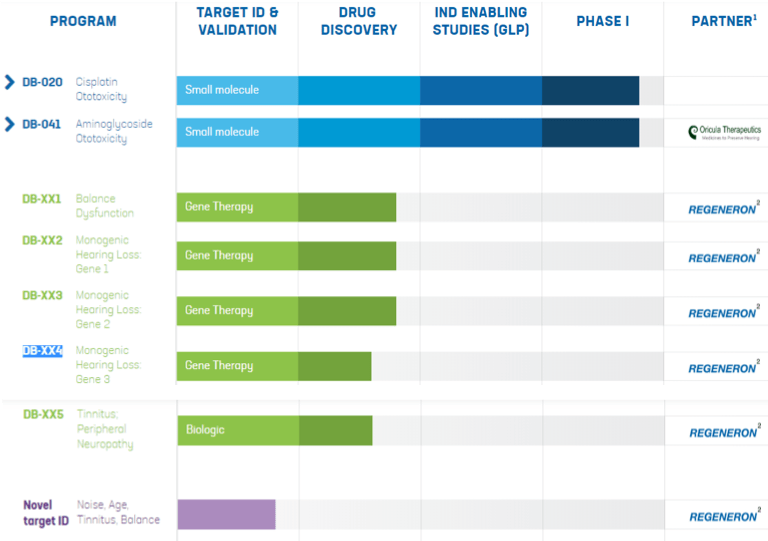 The company has so far filed over 45 Investigation new drug applications (IND’s) and has launched 17 therapies. It has successfully executed 4 IPOs and raised more than $5.5 billion in capital. The company’s approach to treating hearing loss revolves around its understanding of the genomic changes linked to hearing loss which helps them narrow down the selection of right compounds with the most potential. Its lead candidates for hearing loss DB-XX2, DB-XX3 and DB-XX4 are exploring gene therapy as a possible solution. In addition, its pipeline consists of DB-020, a small molecule for the treatment of Cisplatin Ototoxicity, DB-041, a small molecule for Aminoglycoside Ototoxicity that is being developed under a licensing agreement with Oricula Therapeutics and a novel target id for Tinnitus and Balance. The company has a strategic partnership with Regeneron whereby it receives financial support for its research and development initiatives, in addition to giving it access to a world-class genetic research and drug delivery platform. Decibel retains its right to the development and commercialization of any product developed through this collaboration. 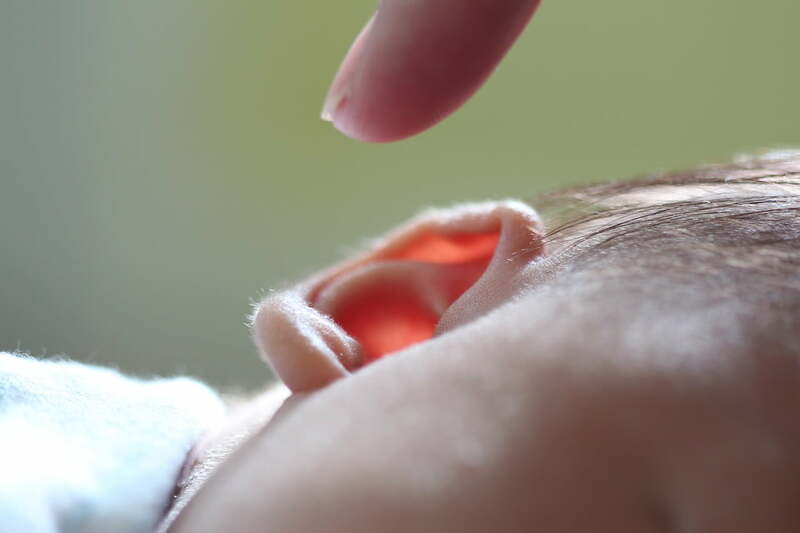 It has also entered research collaboration with Coccon Biotech to apply Cocoon’s proprietary silk fibroin platform to the development of therapeutics for hearing and balance disorders. The company is backed by a robust investor network consisting of institutions such as Third Rock Ventures, SR-One, Foresite capital and Bessemmer Trust to name a few. Fennec’s PEDMARKTM is a novel formulation of Sodium Thiosulfate that is targeted at prevention of Cisplatin Ototoxicity in pediatric patients. Cisplatin is a platinum compound that is part of chemotherapy for pediatric malignancies. 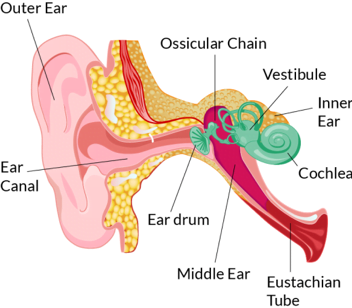 Its use invariably leads to ototoxicity and leaves the patient suffering from a lifetime of hearing disabilities. The drug has received an Orphan Drug Designation from the FDA for use in the prevention of platinum-induced ototoxicity in paediatric patients; in addition, it is also eligible for a Pediatric Use Marketing Authorisation (PUMA) status giving it 7 and 10 years of market exclusivity respectively. Pedmark is a formulation of sodium thiosulfate (STS), a water soluble thiol compound that can act as a reducing agent. It can inactivate platinum complexes and render them non-cytotoxic by covalently binding electrophilic platinum with thiol; it also provides delayed administration, reduced toxicity and enhanced levels of endogenous reducing agents such as GSH. Fennec has licensed 1 US and 9 foreign patents from Oregon Health and Science University for STS which expire in 2021 in Europe and Japan. It secured a $12.5 million debt financing with Bridge Bank for a targeted 2020 commercial launch. As per its Q4, 2018 financial results the company had cash and cash equivalents equivalent to $22.8 million as of 31 December 2018. GenVec has developed a hearing loss gene therapy named CGF166, a recombinant adenovirus 5 (Ad5) vector containing a cDNA encoding the human Atonal transcription factor (Hath1) for administration through intra-labyrinthine infusion in collaboration with Novartis for improving hearing in patients suffering from profound unilateral or bilateral hearing loss. The company has been acquired by Intrexon for its AdenoVerse™ gene delivery technology platform. The company plans to leverage the significantly higher payload capacity that exceeds 30kb, to allow it to deliver multiple therapeutic effectors that are not possible with current viral delivery systems. It will be integrating its RheoSwitch Therapeutic System® platform with Genvec’s AdV-based technology to produce cutting-edge gene therapies. 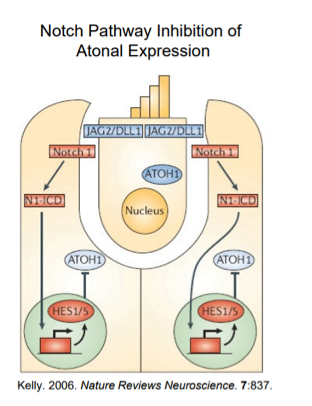 Atoh1 is expressed during embryonic development stage and genetically silenced in adult tissues. The technology aims to reintroduce Atoh1 through a virus into the internal membrane of the ear. - New treatment approaches in the SUI market aim to plug the leak!